The TechFinancials trading platform comes with the economic calendar feature that is found within the trading window. This broker offers a mobile app to enable traders to trade on the go. Traders can also make use of social trading to follow, track, and copy the performance and trades of the top five traders at any given point in time. The minimum deposit amount accepted is $200, and there are also maximum daily, weekly, and monthly deposit limits for traders. The 365BinaryOption website is available in English and Chinese. This broker offers 24/7 customer support and you can contact their agents via email, live chat, or phone to local numbers in the UK, South Africa, Canada, Ireland, Singapore, and Australia. The broker also offers useful educational materials through its info-packed education center which hosts interactive courses, e-books, and videos for both novices and experienced traders as well as a helpful economic calendar, economics courses, and clearly explained trading strategies. 365BinaryOption offers customer support from 7 AM to 7 PM. It's essential to realize that hardly any service in the Binary Options Brokers category will be an ideal solution able to fulfill all the requirements of different investors. It may be a good idea to read a few 365BinaryOption reviews first as some solutions might actually dominate just in a specific geography or situation or be created with a very specific customer in mind. Others may work with a goal of being simple and intuitive and therefore lack complex functions welcomed by more experienced users. There are also services that support a large group of users and give you a rich feature set, but this in most cases comes at a higher price of such a software. Make sure you're aware of your needs so that you get a service that offers exactly the features you look for. We realize that when you make a decision to buy Binary Options Brokers it’s important not only to see how experts evaluate it in their reviews, but also to find out if the real people and companies that buy it are actually satisfied with the product. That’s why we’ve created our behavior-based Customer Satisfaction Algorithm™ that gathers customer reviews, comments and 365BinaryOption reviews across a wide range of social media sites. The data is then presented in an easy to digest form showing how many people had positive and negative experience with 365BinaryOption. With that information at hand you should be equipped to make an informed buying decision that you won’t regret. What Bonus Does 365BinaryOption Offer? 365BinaryOption allows you to enjoy 1 week of risk free trades. This broker offers bonuses on a one-time basis. These are promotional offers that are limited by time so you have to act quickly to activate the bonus. To become eligible for a bonus, you need to make a deposit of at least 300 USD, EUR or GBP. All bonuses will be made available immediately to you for trading and need to trade your bonus value 40 times before you can withdraw it. 365BinaryOption is a broker not regulated by any trading authority. Having said that, the firm has firmly established itself as a reliable organization by fielding expert customer support personnel as well as becoming one of the firms with fast withdrawal rate. 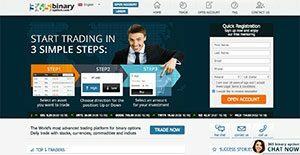 The TechFinancials platform, although not as popular as SpotOption, has proven to be an easy and reliable platform to use for online binary options trading. Light, fast, and clutter free, the TechFinancials platform helps in eliminating slippages caused by traders. If you need more information about 365BinaryOption or you simply have a question let us know what you need and we’ll forward your request directly to the vendor.